Atmospheric Water Generator (AWG) Market size exceed USD 800 million in 2015 with 30% growth estimation from 2016 to 2024. Declining freshwater resources coupled with increase in infrastructure investment will drive the global atmospheric water generator market share in future. Positive outlook towards industrial sector in China, Indonesia, Malaysia, and India will further complement the industry growth in future. Water resource depletion associated with growing population causes huge threat to human and animal life. As of 2012, Global average per capita availability of water from renewable resources was over 19500 m3/ person and has shown sign of decline by approx. 20%. Renewability of water is based on hydrological cycle. Rising temperature coupled with insufficient rainfall cause a fluid shortage in many parts of world which makes lakes and river beds running dry. Water resource depletion and lack of liquid supply will positively encourage the market size in future. Technology advancement of atmospheric water generators technology enables industry manufacturer to design more efficient generator as compared to old and reduce environmental concern. This will further stimulate industry outlook in near terms. Coal based generator emit high carbon emission as compared to other technologies such as desalination units and reverse osmosis. Stringent government regulation and directives to ensure safe water supply will propel the market share in coming years. EU nations has implemented Drinking Water Directive and U.S. has introduced Safe Drinking Water Act to ensure clean water supply to general population in this region. According to WHO over 45% of world pollution has been caused by pathogenic microorganisms. High power consumption associated with growing concern towards greenhouse gas emission is expected to hamper the atmospheric water generator market size growth. Industry participants are introducing new technologies to increase the sales in commercial and residential sector by reducing overall cost. Lack in technology coupled with high power consumption may act as restrain for the market share. Certain units require more than 2.5 kWh per litre power to operate. This factor creates difficulty to adopt technology in high electricity tariffs area. Atmospheric water generator market size demand from residential applications was valued over 13 million in 2015. Increasing large scale installation in the U.S., Saudi Arabia and Africa will foster the industry growth in coming near terms. Industrial application is expected to witness growth over 25% by 2024. It has wide application in building industry and heavy manufacturing industries such as steel, paper and oil & gas. 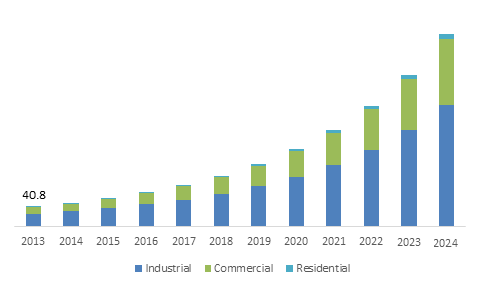 Commercial AWG market may witness considerable growth during forecast period subject to rising demand from military and commercial properties applications. These are installed in malls, offices, hotels and military camps to ensure availability of water. China atmospheric water generator market size was valued over USD 100 million in 2015 owing to rising urbanization with shifting consumer lifestyle trends. Rising drought occurrence and insufficient rainfall will further positively encourage the industry growth. Germany market share is expected to witness growth over 20% from 2016 to 2024. Stringent government regulation given by regulatory bodies including REACH and European Commission is expected to drive the industry growth in future. Saudi Arabia is predicted to witness growth over 30% by 2024 owing to availability of lack of ground water resources. These machines have gaining significant adoption in various sectors such as municipal agencies, banks, hospitals and schools owing to its high purity offering features. Major industry players include Dew Point, Saisons Technocom and Watair Inc., Island Sky Corporation, Atlantis Solar, Konia, Ecoloblue and Fujian Yuxin Electronic. Atmospheric water generator is designed by using technologies such as cooling condensation and wet desiccation. Cooling condensation technology is primarily used subject to wide implementation of this product in commercial and residential applications. Wet desiccation technology is newly adopted. It has application in heavy manufacturing & production industries and military.